• See the Early Music FAQ for additional information. The Orlando Consort and Perfect Houseplants reunite for their second intriguing collaboration—a fascinating blend of medieval polyphony, composed jazz, and improvisation. "This album will suit you if you are broad minded about your music and have a taste for jazz. I missed the first collaboration between the Orlando Consort and Perfect Houseplants, but in view of this extraordinary album, I will now be seeking it out...What makes this collaboration unique is the subject: the contributors have fashioned a modern Mass out of the medieval melody, The Armed Man. Groundbreaking..."
"For the Houseplants and the Orlandos, the boundaries are between eras – five centuries apart – and between ears; jazz enthusiasts, who might balk at the high-pitched men’s voices, and early music devotees, unused to the clatter of jazz. Yet most artists have a talent for collaboration that crosses the borders of language, culture, time and space. The best way to appreciate such albums is to listen in the generous spirit in which they were made." "On this spectacular CD, the Orlando Consort and Perfect Houseplants create a fusion of jazz and medieval music that is truly breathtaking. The combination of the Consort's impeccable vocal harmonies and the Houseplants' improvisational wizardry miraculously captures the musical essence of each. The CD is “a modern Mass for the Feast of St. Michael,” replete with the traditional musical accoutrements of such a work. But above and beyond the construction there is a sublime co-mingling of lithe piano and sax solos, parallel vocal harmonies and incisive rhythmic displays that illuminate the commonalities of invention and expression that these seemingly disparate musical forms share across the centuries." "...a rich and subtle jazz setting of the Roman Catholic Mass on Harmonia Mundi, composed by eight more Brits—the combined forces of the Orlando Consort male vocal group and the jazz quartet Perfect Houseplants." "For an outsider, the world they’ve created is quirky and a bit difficult to comprehend at first. But you also can accept the prospect that these world-class artists are sincerely working to renew and expand a musical form that’s become static or even irrelevant for most listeners in the 21st century. However you cut it, this is music for the curious, more adventurous listener." "As with many listeners, I tend to find a little early polyphony goes a long ways with me, but due to the ever-creative improvisation element brought to the forefront in this collaboration, I was listening more deeply into the music and enjoying it a great deal more. It definitely calls for repeat listening, and the crystalline sonics make that a pleasure to do." 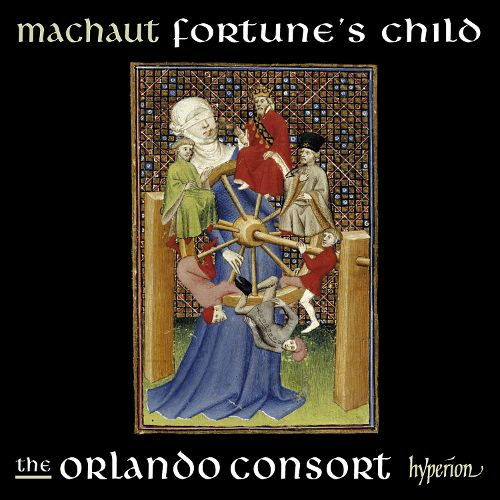 You are listening to Riches d'amours, a track from our latest release on Hyperion of musci by Guillaume de Machaut, the great French poet-composer. You can hear more on the Hyperion website, read the engaging liner notes, and order or download tracks or the entire album in a number of formats.